The Region is also famous for its palm-fringed beaches, fascinating fishing vilages and historic towns, and rich natural attractions. Kakum National Park, just 30km north of Cape Coast, is the foremost nature reserve in Southern Ghana and well worth a visit. Almost untouched virgin rainforest has been preserved as a habitat for birds, butterflies and rare local animals. 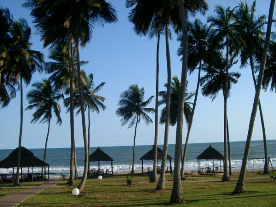 The castles along the coast of the Central Region are amongst the best preserved in Ghana. 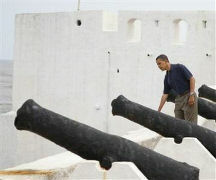 Not to be missed are Cape Coast Castle, Elmina Castle and Fort St. Jago. The Kakum National Park Visitor Centre (KNPVC), managed by Ghana Heritage Conservation Trust (GHCT) built with funding from USAID and technical support by Conservation International (Cl) is located on a 512-acre land adjacent to the Kakum National Park. The Centre has facilities that promote conservation education and awareness. Kakum Rainforest Café encourages conservation efforts at the Park by supporting local farmers through the purchase of fresh produce while providing a relaxing location for visitors to enjoy a fine meal and refreshing drinks. The "Hidden Connection" exhibit interprets the complexities which underlie tropical rainforest diversity, the interdependencies among species, and the numerous biological connections which make the rain forest a "web of life '. It also highlights the cultural connections that the people of southern Ghana have with the natural world that make them part of this "web". At least forty-five minutes should be planned for visitors to experience the exhibit as it prepares them to enter the rainforest and to notice more of the scents, sights and sounds unique to the forest environment while increasing levels of enjoyment and conservation education. This campsite is located 200 meters from the Kakum Visitors Centre. The Afafranto campsite is ideally positioned for visitors wanting an easily accessible forest camping experience. Visitors with a special interest in birds now have a new trail that is specially developed to incorporate three ecosystems: the rainforest, the secondary forest and a pond environment. Visitors can use this trail to search for more than 400 bird species found on the Kakum bird checklist. The departure times for bird watching can be specified when making a booking for the trails and guides. 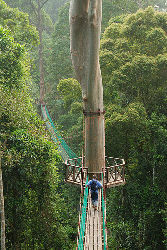 The Kakum Canopy Walkway, Africa's first and only rainforest walkway, is composed of 350 meters of suspended bridge and six tree platforms that reach the height of 30 meters above the forest floor. From the treetops, visitors experience a unique and spectacular view of the rainforest ecosystem and have the opportunity to see flora and fauna, which could never be viewed from the ground. Hundreds of species of butterflies and birds can be viewed from the Walkway early in the morning and if visitors are lucky, they may catch a glimpse of the Spot-nose, Columbus monkeys. The Kakum National Park is a fairly old national park, having been established in 1932 and used for the last fifty years for the extraction of timber. 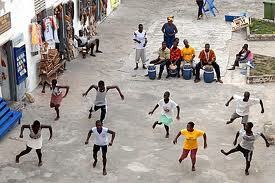 It is located in Central Region of Ghana, about 20 kilometres north of Coast. It covers 360 square kilometres of Ghana's rapidly dwindling rainforest. 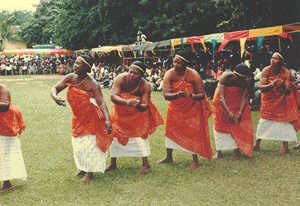 The government of Ghana officially opened the park in 1994. USAID/Ghana provides institutional support to the Ghana Heritage Conservation Trust to ensure the sustainability of National Park. 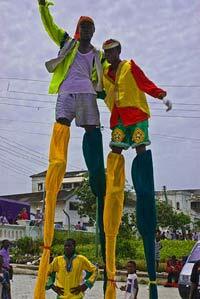 It started around the 1920's and is celebrated on the 1st of January every year and draws large crowds from all over. 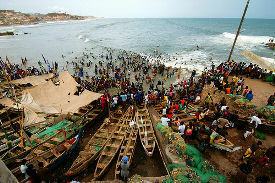 A fish-catching ritual is performed at the banks of the Benya Lagoon by the Asafo Companies in their full regalia. The Paramount Chief and his retinue are present at the banks and musketry is fired. On the eve of the festival, the Paramount chief climbs up Fort St. Jago and fires shots at midnight to usher in the New Year. The Paramount Chief rides in a Palanquin the next day to pay homage to the various clans.Libation is poured using locally prepared wine and there is sprinkling of mashed yam as well as shaking of hands with family heads to signify peace, prosperity and good health in the coming year. 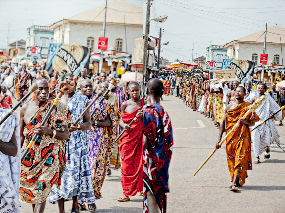 The paramount Chief and his elders converge in front of Elmina Castle where a sheep is slaughtered. There is merry-making drumming and dancing throughout. Literally translated means "The opening of the Lagoon" or the Draining of the Lagoon". 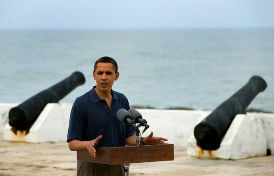 It is celebrated to commemorate the founding of the town, Elmina by the Europeans. It is also celebrated to invoke the deity, Nana Benya's continuous protection of the state and its people. There is royal possession made up of gorgeously dressed chives and stool carriers, some riding in beautifully decorated palanquins. After performing some rituals at the riverside, the chief priest casts his net three times and announces the lifting of the ban on fishing, drumming, funerals and other social activities in the traditional area. There is a spectacular ride on the lagoon by women resplendent in "Kente" cloth and local festive headgears. A royal procession leading to the chief's palace amidst traditional music ends the festival. 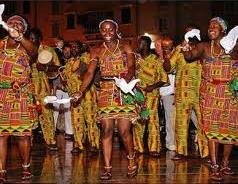 On Friday, the two Asafo Companies (traditional warriors) joined by the inhabitants, take to the streets of Jukwa amidst drumming and dancing. Later the Chief is carried in a palanquin to a sacred place where sacrifices are made to departed royals of the State. The festival is very colourful and it’s like a grand festival there is a processing of chiefs, drumming, dancing and firing of musketry but this is uniqueness in the traditional attire of the various warrior groups and the slaughtering o a cow in public for the 77 gods of Oguaa (Coast). But there is another significant feature ceremony “Bakatue" involves cutting through the sand bar separating the Fosu lagoon and the sea to allow the lagoon access into the sea presumably to bring more fish into the lagoon.